Posted On December 26, 2016 by Team iCynosure. Every Year on New Year eve most of us tend to make numerous resolutions of what we should be doing to make the New Year count. However, at iCynosure we realise how every year, every other person we’ve met has never been able to keep their resolutions. So where did this idea really come from? For an insomniac like me, who refuses to sleep at night and cannot make it to witness the sunrise, this is the resolution I used to make every year and always failed to fulfil. Whether it’s joining the gym or a zumba class; I’ve tried this year-on-year only wasting time and money. This year I'm saying hell to being a fitness freak and hurray to enjoying life as it comes. Promising to be a better version of myself, making up for the all the follies I’ve committed in the year, etc. etc. Hello, I’m actually pretty awesome and already the best I can be. Who can improve perfection? Last year one of the most prominent resolutions I made was to switch off. However, considering my work which is largely social media driven it was to fail right from the start and it failed within a few hours. How silly was it for me to make a resolution as such? Isn’t my blog a way of expressing myself through my writings? So, the beautiful notebook I purchased to pen my thoughts is still sitting pretty in my bookcase. Go mad doing 10 things at the same time and be frustrated to world’s end. I’ve multi-tasked a lot and am very good with it too. However, if you ask me, I’d prefer to live in the moment, concentrate on what’s at hand and then move on to the next task. Like when? Every day! What all can you bundle in a year to ensure you keep this resolution? It will ensure you are adequately stressed every single day and feel wasted. When I see something that has remained incomplete for a while I know that the reason for it being incomplete is basically it doesn’t merit to be completed. So if I've abandoned something midway, I don’t think it is worth a second shot at. As much as I like to believe I am capable of complete forgiveness, let’s be honest I’m not and so are most of us. And as letting go isn’t possible, I personally steer clear when the situation arises or stay away from the endless cycle. Hahaha, really! What fun would it be to actually sit out and be the person who can keep that resolution? And who doesn’t really make any resolutions for the New Year? What about you? Made any resolutions and broke them instantly? 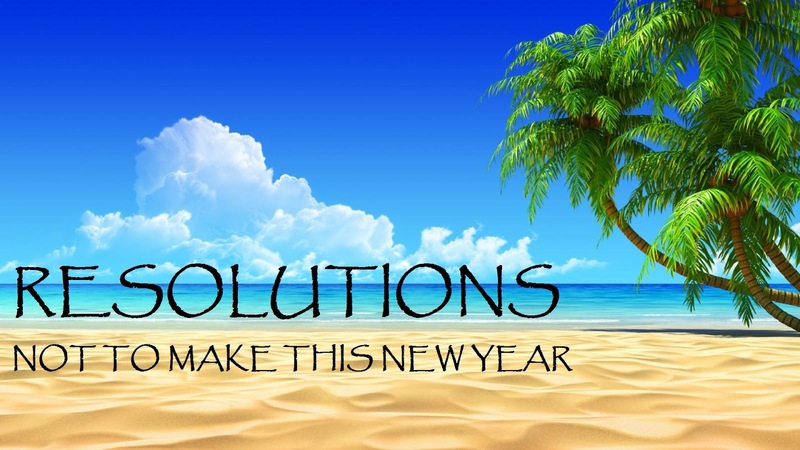 Let me know which is the one resolution you are absolutely sure not to make this new year. We are a few days away from 2017, and almost all of us would be keen on making #NewYear #Resolutions. However at #iCynosure we recommend not to make any resolutions, especially the ones listed here.